Our system provides slow motion playback and instruction using interactive and immersive scenarios. We offer low-light scenarios that enhance skill with tactical sweeps and clearing procedures. We have over 500 scenarios, many with branched options to enable the instructor to change things up so the trainees are unable to anticipate what is going to happen next. The replay provides 100th of a second timing, slow motion playback, and more. OC Spray: We have OC Canisters that operate on our system where the training objective includes non-lethal options. The scenario includes the reaction of the person being sprayed. Taser: We can add X26 Taser that operates on our system where training includes non-lethal options. The scenario shows the reaction of the person being tased. Future-Baton: We can add a baton that operates on our system where training includes non-lethal weapons. 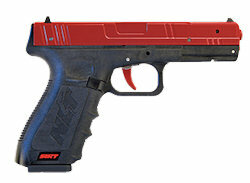 Shooters can select the basic Shot Indicating Resetting Trigger(SIRT), which accurately conforms to Glock 17 shape and weight. We can provide laser inserts for a wide range of weapons and calibers that simply insert into a duty weapon from 9mm to 12 Gauge Shotgun. LASER with RECOIL: We currently have Glock 17 9mm, S&W M&P40 caliber, AR-15 and AK-47 that contains an air recoil system delivering about 65% of the recoil of a live fire weapon. 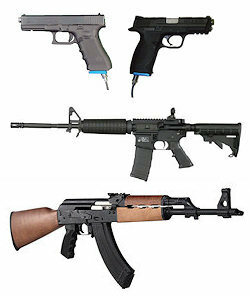 These are real weapons modified for air recoil and are incapable of accepting live ammo. We can also obtain air recoil kits for a wide range of other weapons, if needed. MOBILE: We can bring the mobile simulators to your location, set up, train your instructor(s) / trainer(s) or operate the simulator for you. We can leave the system in place for the amount of time needed to complete the training at YOUR LOCATION at YOUR CONVENIENCE. FIXED: You can also schedule your training at our fixed location at our sister company, the Stockyard Gunfighter in Fort Worth. We can train your trainers or we can operate the simulator for you at our fixed location. No matter what option you select, we will provide you high quality simulation at the lowest possible cost. The cornerstone of our company is to work with you to ensure you get the training you want and need, on your schedule.